The Cookie and Kate App is Here! It’s here! I can finally tell you about the project I’ve been mentioning over the past couple of months—the Cookie and Kate app is official! I always want you to feel entirely confident every step of the way, and now I can personally guide you through each recipe, from start to finish. 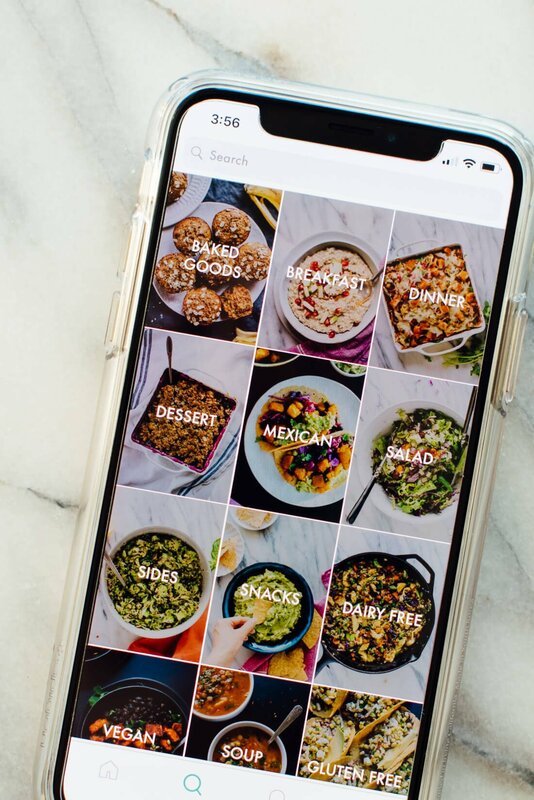 The app offers step-by-step voice guidance from yours truly, and photos that guide you through the cooking process. It’s like I’m right there in your kitchen with you. 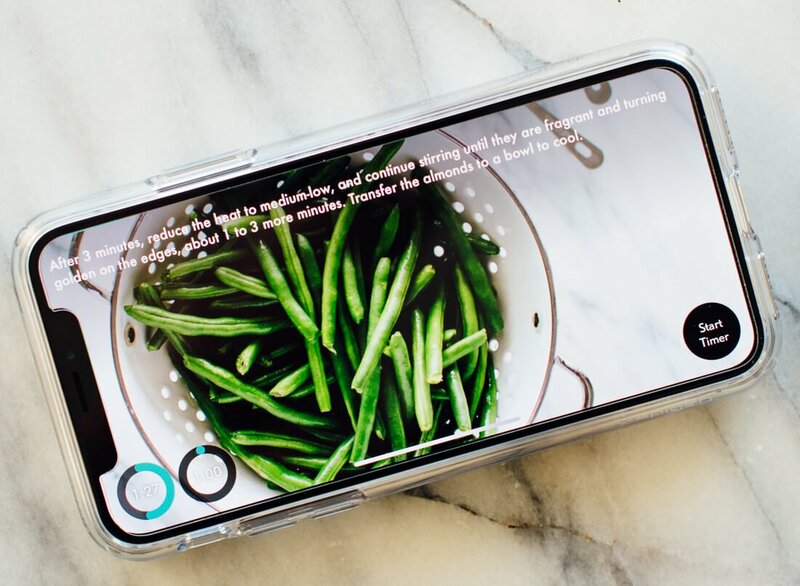 Hit the “Start Cooking” button and I’ll guide you through each step, offering photos and built-in timers along the way. The Cookie + Kate app is now available on the Apple Store and Google Play! It runs on iPhones, iPads and Android devices, and costs $4.99. Just search for “Cookie + Kate” in your app store to find it! 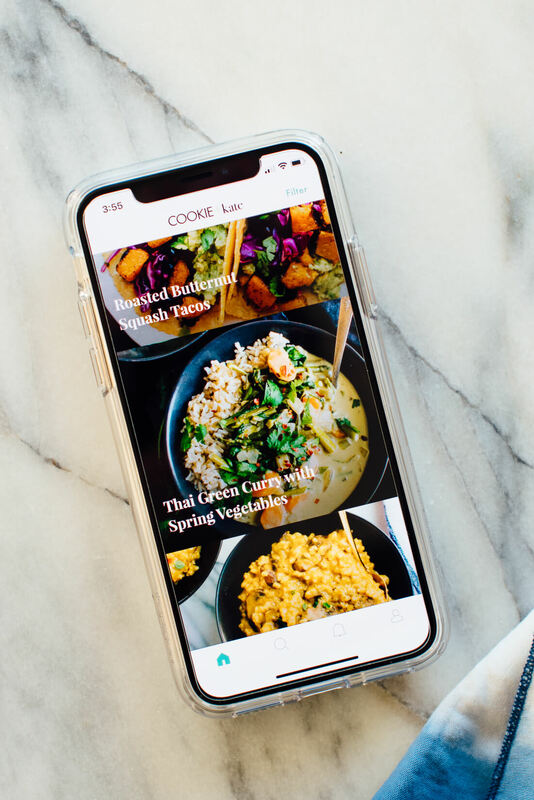 Our new app offers 100 of the most popular recipes on Cookie and Kate, and we’ll be adding more of your favorites soon. I teamed up with SideChef to bring you a beautiful, helpful app that I never could have created on my own. I hope this app inspires you to cook even more healthy and affordable, meatless meals. 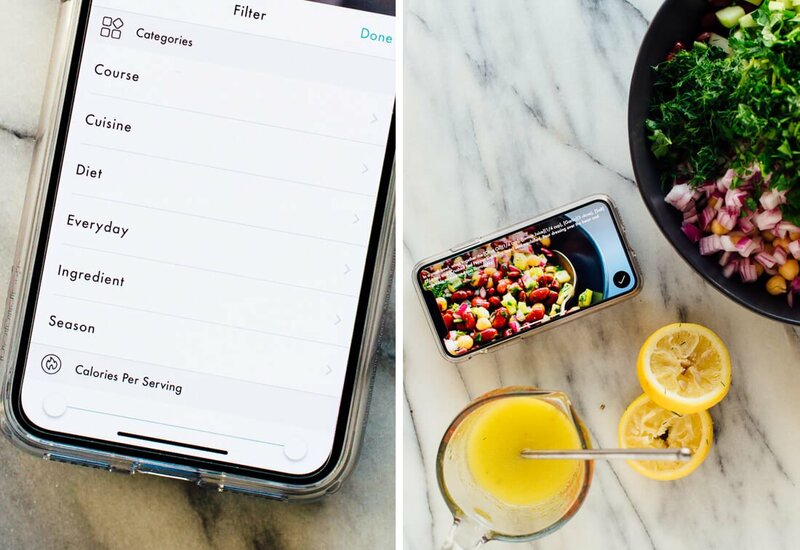 This app is for you if you’re trying to incorporate more vegetables, whole grains and meatless meals into your life. 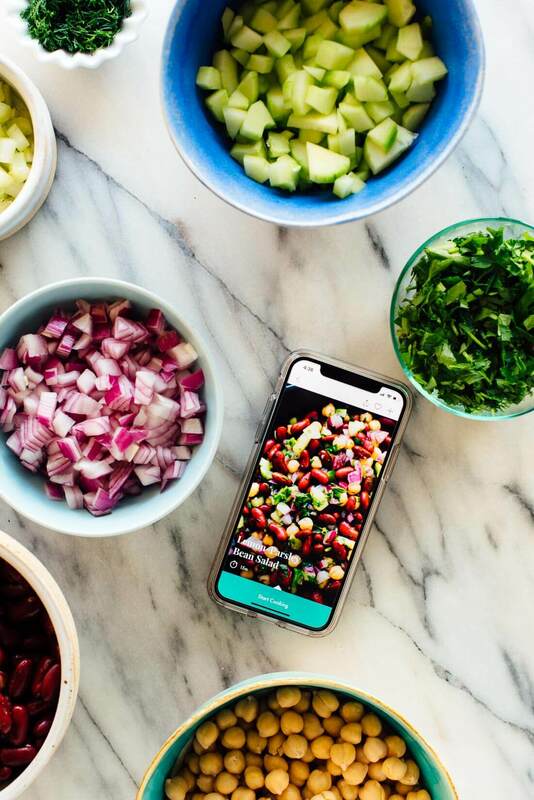 Whether you’re new to cooking or a pro in the kitchen, the app offers tons of features that makes home cooking easier. See the list below! Cook along with me via step-by-step voice guidance. Colorful photos of the finished dish and the steps along the way. Browse recipes through the same easy-to-use category and search filters that you’ve learned to appreciate on cookieandkate.com. Filter recipes by season, course, cuisine, occasion and special diets (dairy free, egg free, gluten free, nut free, soy free, sugar free and tomato free). Keep your favorite recipes handy with convenient offline access. Save recipes to your own “cookbooks” to find your favorites faster. Adjustable serving sizes will scale the recipe up or down to suit your needs and reduce food waste. Easily email ingredients lists for reference at the grocery store. Built-in timers help you stay on track as you cook. Nutrition facts per serving are viewable on a simple click, and you can filter recipes by calories per serving. Upload photos of your results to share with Kate and fellow Cookie and Kate app users. Leave comments and ratings, too! Users outside of the United States will love the option to convert all recipes from U.S. measurements to metric. Download the official Cookie and Kate app on Apple Store and Google Play today! We’ve uploaded over 100 of the most popular Cookie and Kate recipes to the app. More recipes will be added soon (for free)! Nothing is changing on the website—you can continue enjoying all of my recipes here. I can’t wait to hear what you think. Questions, comments or concerns? Email cookieandkateapp@sidechef.com. SO awesome!! Congrats–I know nothing about the process, but it seems like creating an app is, well, kind of a big deal! Yay, thank you, Sammie! It was a bigger project than I anticipated, but I’m so excited to finally share it. I LOVE your idea for a Cookie section. We have a special page in there for the cookbook, so I’ll see if we can add a page just for Cookie! Kate! I just bought the app and I’m SO excited to use it. What a useful tool for fans of your blog! Thank you, thank you, thank you! Kayla, thank you! I’m so excited that you’re excited about it! I’ve triple-checked all the recipes, but please do let me know if you find anything funny or have suggestions on how to make it better. Hope you’re having a great Sunday! Wow! This is amazing! You never cease to impress! Just like your cookbook, your website, and your recipes, you’ve thought of every single detail from the user’s perspective. You set the bar high and you reach it every time! You’re the best, Stephanie! Thank you, that means a lot. If you have a spare minute, could you please rate the app on the app store listing and leave a little review? That would be a big help! Miss you and hope to see you guys when I’m home this spring!!! Wow how exciting Kate! I’m excited to download this app and try it out. Love you and your recipes. I gave your cookbook to my sister for Christmas and she’s excited to make your recipes. Literally didnt even finish reading your post before I bought it. The app looks amazing, I already know Ill use it a ton. Especially with the metric conversion..
Congrats and what a great way to start the new year! Thank you so much, Kathrin! I hope it comes in super handy for you. Happy 2018! Hilda, thank you for saying hello! I’m so glad you found the blog, and thank you for buying the app. Please give your lab a pat for me! Love your blog and cookbook! We enjoyed Chickpea Tikka Masala with Green Rice for our Sunday dinner. Made a double batch because I know from experience that the leftovers are wonderful for lunch. I installed your app and look forward to using it! Thank you. Thank you, Amy! That’s one of my favorite recipes in the book. I hope the app becomes a really helpful tool for you! Kate! Congratulations on the launch of your new app!!! I look fwd to checking it out. Are the current recipes in the app also in your cookbook? Also (and completely unrelated), can you PLEASE recommend a small, compact, highly reviewed tool that dramatically reduces prep time for chopping, slicing, etc? I don’t want a food processor, as clean up/assembly is a pain, and they’re too big. Maybe I’m wishing the impossible- but thought you’d be aware of such a device! Thank you! And well done with the app! Hi Wendell, thank you! No, most of the cookbook recipes are exclusive to the cookbook, but I hope to add a few to the app soon. The app has 100 recipes from the blog. I don’t have the perfect tool to suggest, but you might check out a mandoline for slicing (but be careful—it’s very easy to cut your fingers on those). I also love my 7-cup Cuisinart food processor, which isn’t huge, but it does have a permanent spot on my countertop. Kate- thank you for the tips! I’ll check them out. Thanks for all your great work! Thank you for buying it, Erika! I hope you absolutely love the app! Amazing idea! I am sure that was a major effort and it took a great deal of hard work to make it happen, so sincere congratulations. And let me tell you that I really admire your blog and all of your recipes. I am also a vegetarian and your recipes are a great inspiration. I can only hope that one day I will have a recipe collection of that quality. Can’t wait to download the app and looking forward to new recipes. Thank you very much! It was a lot of work, and it’s so fun to read the responses so far. Thank you for your kind words about my work! Pamela, thank you so much for your support! I hope the app becomes a go-to resource for you, too! I just downloaded your app today! I love it!! Hooray!!! I would love to hear what you think on the blog and in the app store. Enjoy! Happy to support all of your efforts. You have changed the way I cook and have helped me truly enjoy healthy foods that are not “frankenfood.” Anything that makes it easier for me to “get my Kate on” makes me happy. Ha! That’s wonderful to hear. I truly appreciate the support. This is fantastic! Oh my goodness, congratulations!! I love how excited you are, so thank you! Let me know what you think about it. Hi! My daughter introduced me to your recipes. Is there any way I can save those I would like to try? I don’t have a printer. Great question, Nancy! I don’t have that function on the blog. But, I do put all my recipes on Pinterest so you can save them to a recipe board there if you would. Or to get a little fancy, if you go to the print icon and pulls up a separate page, you can always save this as a PDF to your computer. I hope this helps! Thank U. Going to make cookies today. It’s 22 in Kyle Texas with ice and snow. I did make your Orso pasta so good. Just found your site. Just subscribed. Just purchased the app. Super excited! Absolutely hate that you cannot print a recipe from the app. Disappointed. I am new to the vegetarian scene and have been looking for help with planning and cooking new meals. I am a graduate student so I do not have a lot of time on my hands and these recipes combined with your app seem perfect to help me get started! Wow! What an incredible accomplishment! Congratulations! I downloaded it today and I can’t wait to start cooking! I downloaded the app. The recipes look great but I have noticed that there isn’t a measurement after the quantity of an ingredient. Like in the Thai Green Curry with Spring Veggies it says 2 green thai curry paste. 2 what? Tablespoons? Teaspooons? This part of the app is not good. Luckily I found the recipe on your website. Hi Tamara, Thank you for your support! It should have the measurement next to it. For this case, yes 2 tbsp green Thai curry paste. I checked this recipe and it’s there – both in the list and in the step-by-step. It will be in brackets next to the ingredient in the step-by-step. Hope this helps! I actually came to this post to see if you had an answer for this. My iphone app is showing like Tamara’s – there are no Tablespoon, teaspoon, cup, etc. measurements showing in the ingredient list or the the steps. I am guessing it is an app bug! This looks fab. Just wondering if the app and cookbook would be redundant. If I buy the app, does it offer most of the recipes that the book does? The cookbook has different recipes than the app. The app is a resource that houses (right now) the most popular 100 recipes from the blog. I am looking to add more recipes to the app from the blog in the future. It’s a handy resource that walks you through the recipe, by yours truly. I hope this helps! Was trying unsuccessfully to read the reviews on your roasted butternut squash soup. I believe I made it some months ago and it was the best! How can I read the reviews? Bourbon?? And some herb??? If you go to the recipe on the blog, the comments and reviews will be found below the notes and instruction section of the recipe. It may take a second for them to load or show depending on your internet connection. I hope this helps! I have only recently started using Cookie & Kate’s recipes and none of them have let me down! they are full of flavor and a lot of the time cater for dairy intolerance which is what I look for in recipes. Thank you for the amazing recipes Kate cant wait to make some more of them especially some desserts, and have the help f your new app by my-side! I’m glad they haven’t let you down! Thank you for commenting, Tahlia. I don’t usually comment on things online but I want you to know that my husband and I love your recipes. We are long time vegetarians, and find your recipes full of flavor and nutrition. Always trying to watch my weight, I find your recipes great for that, too. My children gave me your cookbook for Christmas (at my request) and we have used it much. My fav recipe, I think, is Mexican Quinoa. Yum Yum. We are grateful that you share your knowledge, skills and ideas! Many thanks, Robin B.
I’m glad you did comment, Robin! Love that you have the cookbook too. Thanks so much for sharing. 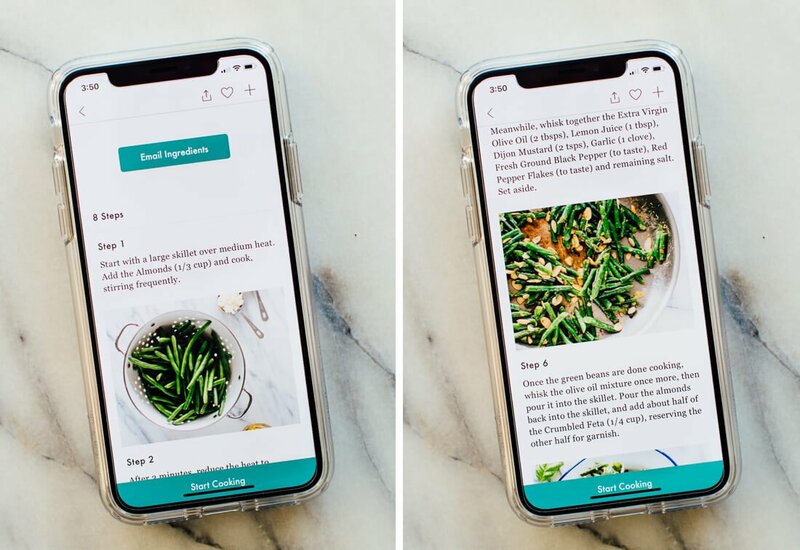 I love your website and would love to download the app, but a friend pointed out there are missing recipes on the app that are on the website :/ Will the app get an update soon? Hi Francisco! The good news is that we’ll be adding another 25 popular recipes to the app soon! This bad news is that there are still a lot more to add. It’s very time consuming and I’m trying to balance new recipe development with app development. I’m doing my best! I just made hummus with your recipe – totally delicious, creamy and a kid-pleaser! Thanks so much for sharing. I have also tried you slide recipes and love them all!! I just purchased the Cookie + Kate app, and cannot wait to read through all the recipes. Thanks for recipes with easy-to-find ingredients that don’t break the budget. Wonderful, Sarah! Thank you for your kind words. I just wanted to take a second and tell you how important your recipes have become in our lives. We started eating nearly all vegetarian and just basically cutting way back on the animal products and your recipes were a god-send! Still are! I use at least 2 of your recipes every single week and have been doing that for months now. Thanks for all that you do! Please keep doing it. You are so talented! Thank you so much, Payton! I’m so happy to hear the blog is such a great resource for you. I really appreciate your kind words! Your cookbook has brought so much joy to my kitchen! I’ve been very busy in the last several years completely my medical training and had little time for cooking or preparing food. After I got married last year and settled into a more regular lifestyle, I found your recipes. Now my husband and I both have fun making and eating the meals found in your cookbook. I appreciate the pictures and your dog (being a dog mom myself)! If you had another cookbook in the future, I’d be first in line to buy it! I’m sorry to hear you feel that way, Sandra! What specific features do you feel don’t like or that are missing? So glad I found your website. I have decided to switch to a vegetarian diet. Other websites make cooking vegetarian meals seem overly complicated and off putting for the average home cook. Your site is completely approachable. Thank you so much. I look forward to feeding my family some wonderfully healthy meals from your site. Got the app. I really like how it’s organized. Very clear instructions. Keep up the good work and looking forward to more recipes! Wonderful, Mary! Thanks for letting me know you are enjoying it. If you wouldn’t mind reviewing the app in the app store, I would appreciate it! I’m so glad you like it, Sara! just downloaded the app after finding your page today googling for vege recipes ! love it !! look forward to trying lots of things !! Thanks so much, Brenda! I can’t wait to hear your experience. Be sure to share your experience in the app store. Hi Sally, I can unsubscribe you. Please send me an email at hello@cookieandkate.com and I will take care of it. :) Thanks for subscribing! I totally get it. I really enjoy your recipes and bought the app a while back. Do you sync it with the new recipes you put out? It sort of seems like it isn’t updating at all. What’s the status? Hi Greg! Right now, my app is just the top 100 recipes from the blog. We are looking to add some others in the future. Stay tuned! Thanks for the C+K support! I just found your sight and I love it. I have tried a couple of your recipes and they were both very good, a broccoli salad and black been soup. I changing to a plant based diet and I am gluten free. So, thank you, I am doing the oven baked tofu today. Welcome, Ruth! I’m glad you came across the blog. Hi there. As an old gal I don’t have Instagram however wanted to let you know that I made the Vegetable Lasagna last weekend for my vegetarian son and daughter-in-law. It was a HUGE hit. My husband has requested it again this weekend. I will however use ricotta instead of cottage cheese as we need to watch hubby’s sodium intake. It was absolutely delicious and made a veggie lasagna lover out of me. I’m glad you love ti! Thank you! I’m always looking for good tasting vegetarian recipes. I stumbled across your site and tried a few recipes for dinner entrees. They were a big hit. Thank you for sharing your wonderful collection of delicious recipes. I Don’t usually by recipe books, but I just purchased your book from Amazon because I know it will be used a lot. Your app look interesting, so I will have to check that out soon. I’m so excited you got the cookbook! Thanks so much for the support, Henry. Thank you! I appreciate the feedback, Sarah! I do like sharing recipes in real time, that’s why the blog is so great! You’re recipe for baked blueberry oatmeal isn’t working…. help!!!! Hi Loni! I’m sorry for your experience with Cookie and Kate this weekend. My website hosting made a big mistake and I’ve worked with them to resolve the issue. All should be working now. Let me know if you have any issues!